Welcome to FOUR SWANS VISION! What is Four Swans Vision? We are a not-for-profit Constituted Voluntary Community Organisation, dedicated to improving the lives of visually impaired people aged 18 years + and their companion. We were founded to provide peer support and social activities; it is our intention is to address the loneliness and isolation felt by many visually impaired people (VIP) in a variety of ways. The group will give you a chance to exchange ideas, discuss issues with your peers, socialize and go on days out. We want everyone to share the Four Swans Vision experience with us either virtually or physically. It is an all inclusive group attempting to break through the terrible isolation felt by so many. Our main objective is to demonstrate how lives can be changed with technology and friendship. Are at the beginning of accepting eyesight loss and finding it hard. Feel isolated or invisible in social situations. Want to know more about accessibility for people with visual impairment. Have suffered from sight loss for some time and wish to share your experiences. Are a companion/carer for a visually impaired person. We meet, in the CVS Community Shop in Waltham Cross Town Centre on the first Wednesday of each month, for a meeting/get together and the third Wednesday for a trip out or activity. "Four Swans Vision Visually Impaired Persons' Tennis Group", we play on Fridays term-time at the Laura Trott Leisure Centre in Cheshunt, Herts. We also provide guides for "Four Swans Vision Visually Impaired Persons' Running". "Four Swans Vision Visually Impaired Persons' Golf". Fundraising for FSV - We endeavour to fundraise, which helps subsidise trips/activities with our famous Teddy Tombola/Items for sale. Our Sensory Garden beds at the Holmesdale Open Space in Waltham Cross - we are involved in planning/creating and up keeping our Sensory Garden Beds. or Send us a message through "Contact Us" page after finishing reading these articles. TO THE ORGANISATION IS BY APPOINTMENT ONLY AS WE DO NOT OPERATE A DROP IN SERVICE, Thank You. We are very lucky to have a physical and virtual group. As you have already entered our site you can just click on contact us and join as a virtual member. This is open to everyone even if you have no eyesight problems or don?t even live in the country! Four Swans Vision is a not-for-profit voluntary organisation, relying solely on donations, fundraising activities and funding. We operate a Yearly Membership Subscription. Members are also asked to contribute for the cost of activities/days out & travel, which we endeavor to subsidize through fundraising. What is assistive and adaptive technology and how can it benefit a visually impaired person? It is the ability to access information using specially programmed software. This can vary from audio description on television to surfing the internet or general computer usage by using audio screen readers or visual magnifiers. Four Swans Vision intends drawing from connections it has made with commercial providers such as Apple Store and charitable institutes such as Ability net. However, the most important knowledge base is gained through our members sharing their experiences with each other. All these ideas and suggestions are compiled on our Assistive Technology page. How was the name formed? There is a long historical connection to the symbol of the four swans monument now placed above the Pavilion Shopping Centre. 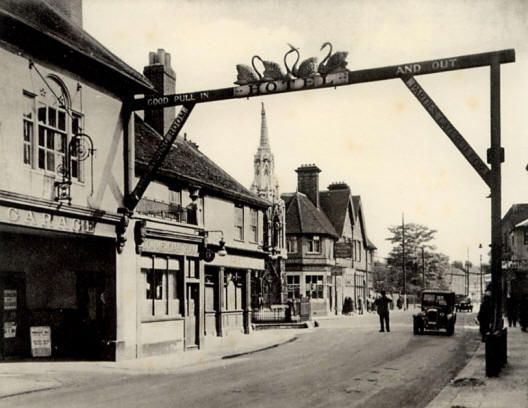 Originally the gallows sign belonged to the ?Ye Olde Swan Inn? which was on the site where the pound shop is today, however it was pulled down in the early 1960s. The Inn is rumoured to be in existence since 1260 and was a 16th century post house. There is a more sinister myth that the wood on the sign gallows was part of a hangmans scaffolding, which stood on the site of Eleanors Cross! Below is a picture of the sign in the 1920s. We chose the 'Four Swans' in our name as this sign is near our office in Waltham Cross and the 'Vision' bit is for our Vision for a better inclusive future, and we have placed a sunrise behind the Four Swans in our logo to symbolise an optimistic bright future. Our motto is 'From the darkness to the light'.